Kuma-Kuma Chan continues in his life of peaceful solitude, even when he travels. Fans of Takahashi’s little bear may be surprised when they think of this meditative character on the go, but in keeping with his usual contemplativeness, his travels are in his mind. He thinks about, dreams about, and writes about great adventures—even ones in which he’s a tiger or he goes back in time—without leaving the comfort of his little house in the mountains. The narrator (depicted from behind as an adult man) confides in readers that Kuma-Kuma Chan sends him travel notes but he can’t read them because the bear writes fast and messily, so he has to imagine how his travels are going. 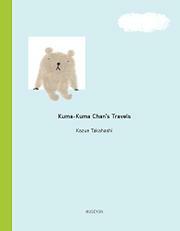 But he tells readers about Kuma-Kuma Chan’s travels in a satisfyingly repetitive rhythm of big, exciting adventures that he then humorously reframes in a much smaller and calmer setting. The illustrations are wonderful simplified shapes and are done in sweet pastels that visually reinforce the quiet world of this charming little bear. Though it’s the third book in the series, it stands alone, but it’s a great reason to check out the other two. A VILLAGE IS A BUSY PLACE!